Home > Product Management Resources > What is Product Management? > Skills and Strategies > What is Product Vision? Ah, the eternal question: what is product vision? We’ve all heard of the corporate vision, so what makes the product vision so important? Quite simply without one, your team has a much harder time keeping on track. A product vision is most simply known as describing the essence of your product. Used correctly a product vision can do a lot more. Here are aspects of a product vision to keep in mind as you are writing one. Product visions give your teams a bigger picture of what they are working on and why. A product vision gives your team the reason why they should be working on this product at this time and for whom. It answers why come in early? Why stay late and work weekends? Why sweat the small details that create great products? Because you are all aspiring to achieve a well-crafted product which will change your customers life in some way. Unless you are Superman or Superwoman, you can’t be with your team at every moment to guide each and every decision. As a product vision is internalized by the team, each person won’t spit out a word for word synopsis of your product vision, but they will create their own version of it. In those moments when they must make a quick decision, a product vision will keep them from going “off the rails” and creating something that violates the product vision. While product visions contain lofty goals, there should also be a component or underlying message that the vision can be made real. The product vision is actionable. At the start we mention that product vision is similar to corporate vision but on smaller scale and at the product level. If you want your product to be successful in the outside market, you want your company to support your work as well. If your product vision has a coherent line of sight to supporting company goals, it’s easier to sell your product up the chain. When would you use a product vision? Product visions are useful when starting work on a new product or aligning a team around updates to an existing product. 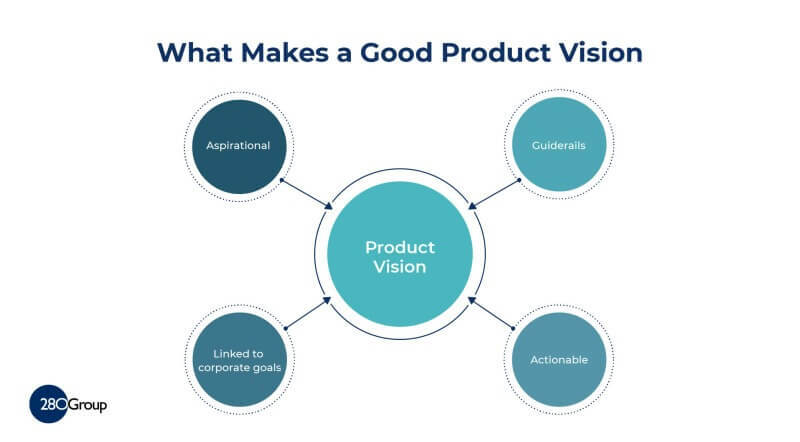 Whether you are kicking off the first version or making tweaks to the nth version of your product, you should start by creating a product vision. There’s a balance here. You want an overall product vision, but you may also want interim chapters as work progresses over the life of your product. The goal is to have each team member internalize the vision and be able to state their version of it. Getting to that point takes a lot of repetition. A lot of repetition. A lot of repetition. State it at the beginning of review meetings. Write it at the top or bottom of your emails. Create a poster and put it on the wall. If it’s important enough for your team to work on, it’s important enough to celebrate the product vision that you share. The traditional format of a product vision statement uses the same format as the positioning statement. Why? Because the positioning statement focuses on the customer and the benefits that the product brings to them. For (target customer) who (statement of need or opportunity), the (product name) is a (product category) that (key benefit, reason to buy). For the business user who needs to be productive in the office and on the go, the Surface is a convertible tablet that is easy to carry and gives you full computing productivity no matter where you are. Unlike laptops, Surface serves your on-the-go needs without having to carry an extra device. Good luck with your first product vision statement either using this format or another one! Just like many things in life, iterate until your product vision resonates within you, your team and your company.